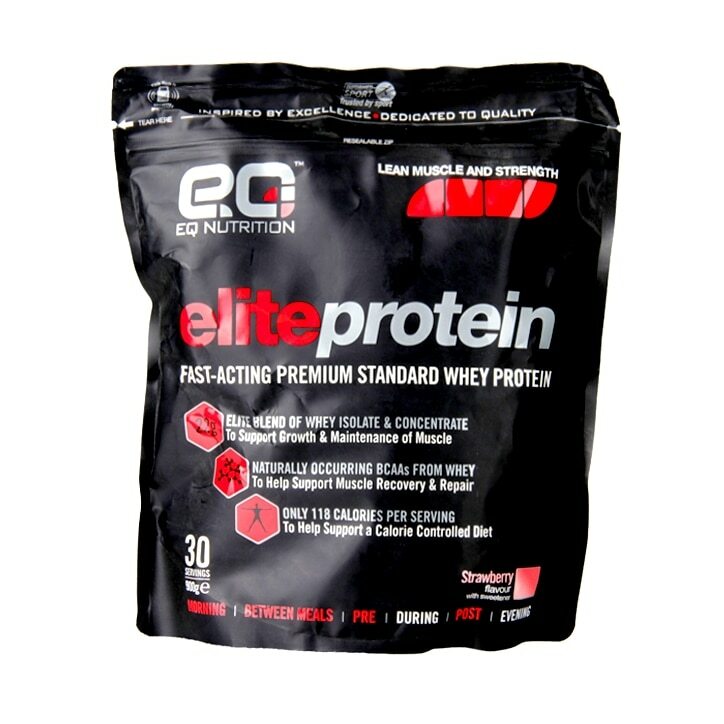 Elite Protein is a high quality Whey Protein powder deriving its protein from an elite combination of Whey Concentrate and Whey Isolate to provide a high protein source which is rich in Branched Chain Amino Acids. Elite Protein combines the best protein sources in a convenient shake allowing it to fit into most diet plans to increase protein intake around training sessions and in between meals during the day. Whey Protein has been shown to increase protein synthesis at a higher rate compared to other protein sources which is why we do not use cheaper protein sources such as soy or hemp proteins in our products. For best results use 2-4 servings of Elite Protein daily. Take one at breakfast, another immediately after exercise and between meals where required. Add 1 scoop (30g) to 300ml of cold water in an EQ Nutrition shaker, shake and consume. Protein Blend (Whey Protein Concentrate (Milk), Whey protein Isolate (Milk), Emulsifier: Soy Lecithin)), Flavour, Creamer (Refined Fractionated Palm Oil, Lactose, Milk Protein) Thickener (Xanthan Gum), Natural Colouring Agent (Beetroot Powder), Sweetener (Sucralose), Sodium Chloride. Keep tightly sealed in a cool dry place away from children. Food Supplements should not be used as a substitute for a balanced and varied diet and healthy lifestyle. Do not exceed the recommended daily dose. Manufactured to cGMP standards for EQ Nutrition. Please see the back of pack for best before date. EQ Nutrition Elite Protein Strawberry is rated 5.0 out of 5 by 1.